Winter. After a long autumn, long in that often by the end of October it's freezing but not this year, Winter has arrived. A mild day, more like Autumn. I took a short walk around the garden. I mean, yes, it's a small garden so it's never going to be a long walk. But this wasn't even a walk around the whole garden, just parts of it. Short. I walked with a specific intention. I want to try my best to take a short walk around the garden each day, taking it in, observing what I usually miss. Because even in a small garden it's easy to miss things whilst you are busy working in it. My health has been crap for a while. Crap in that it means I cannot garden crap. Which is the worst kind of crap. I have been getting help from gardener Andrea, who not only dug out and added some curves to one end of my Shady Border, but has been clearing weeds, mulching, potting up, and sadly for me, planting out bulbs and violas in my large planters. Sadly because I really wanted to do that task. That's one of the best tasks! But health dictated otherwise. This has meant I feel like I hardly get out in the garden and I decided I needed to remedy this with the aforementioned walk. And the idea is that I'm going to try and do it daily, as weather and health allow, to take a moment of observation. Today I observed three things, one of which was obvious and the other two required more work to look. Firstly, the obvious observation. 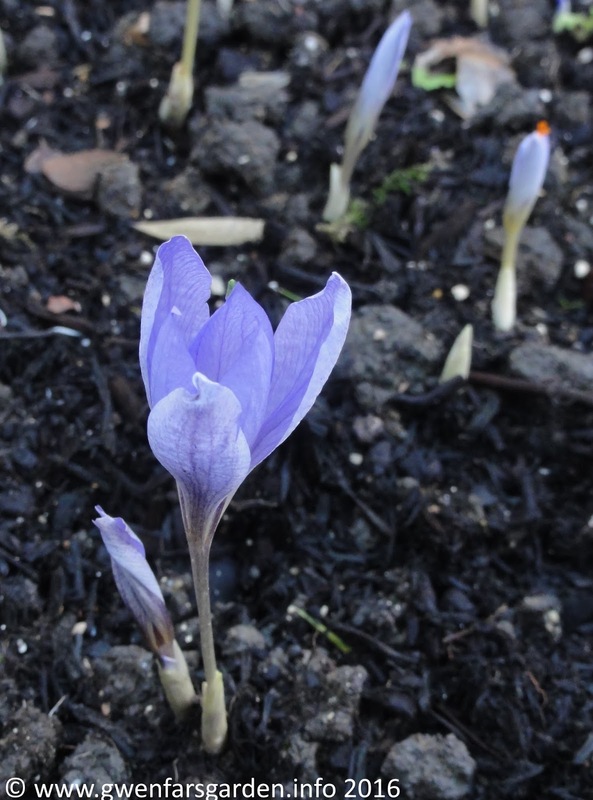 The autumn crocuses planted in the curvy end of the shady border are starting to flower. 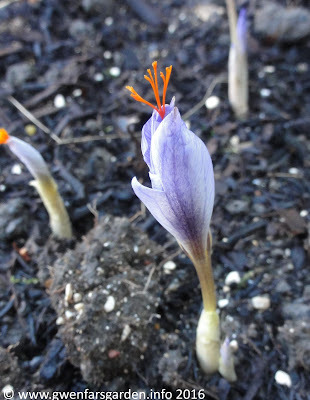 Crocus Speciosus Cassiope, which was planted at the end of October. I was particularly intrigued by how their stamens were holding themselves up high before the petals had properly unfurled. Maybe trying to be really obvious to any passing bee that there was food available? The stamens do recede as the petals fully open. In a different part of the garden, after scooching around the Damson Border at the back of the garden, I discovered mushrooms had sprung up on the rotting old Prunus logs I obtained from my friend J-P over at Next Square Metre. I found that the honeysuckle had come along since I planted it in January, and I need to tie it in a bit more. I've planted this variety because it flowers at the end of Winter, deliberately to help entice me outside on cold days. Whilst it doesn't look like much now, the flowers, oh, the fragrance! Something to look forward to at Winter's end. After about 10 minutes in the garden I was done in. As well as ME, I'm getting over a virus which means double-whammy exhaustion after a short space of time. I returned to the house, to bed. However, I was rather happy about what I found, and feeling good for having been in the garden for a short time. 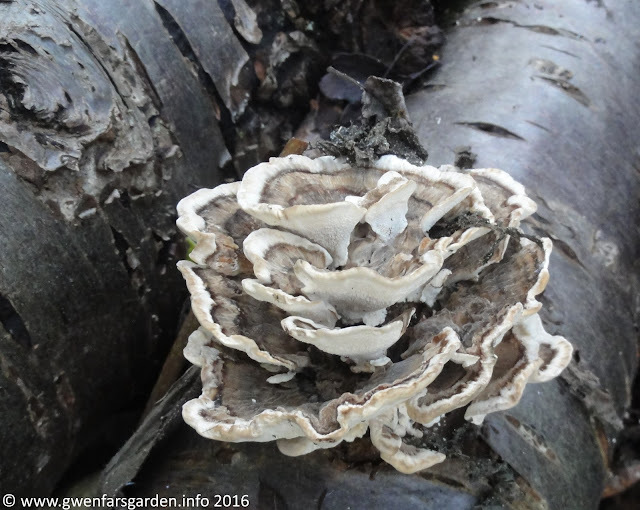 Winter is here, but there is still lots going on in the garden, and I'm going to try and get out there daily/regularly for a short walk, and a moment of observation. Whilst I won't try to to blog about my daily observations, I will try and do a weekly post. Kind of a small goal to help me focus, and to make sure that I do indeed get out into the garden for at least five minutes every day. I wonder what I'll find tomorrow? Sorry to hear you've not been so well. It'd be good to see you both again before you head off to Cambridge, but only if you're well enough. I wonder if the crocuses have some kind of temperature adaptation: or maybe just because it's not quite a "natural" time of year for them yet, the change came along with whatever breeding made them open in autumn, by coincidence. Yeh, it would be interesting to know what triggers the difference between Autumn & Spring crocuses. I've tried googling but haven't found an answer yet. Might ask Twitter - someone must know! I'm really happy with your logs, they are settling in a treat. 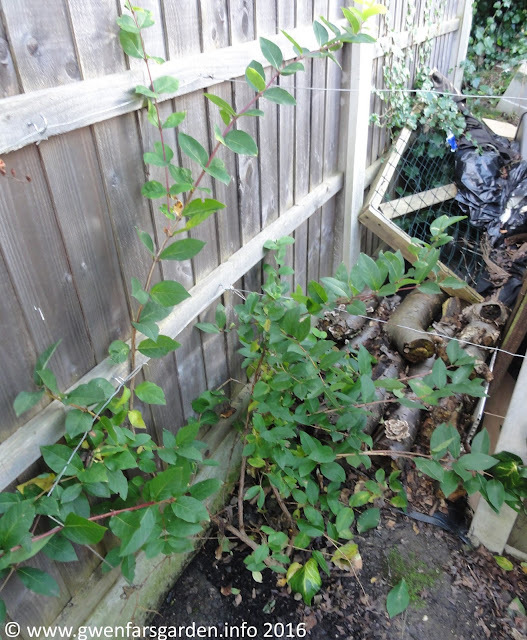 I wonder if I could get some Virginia creeper to grow around the no-so-nice-neighbours? !